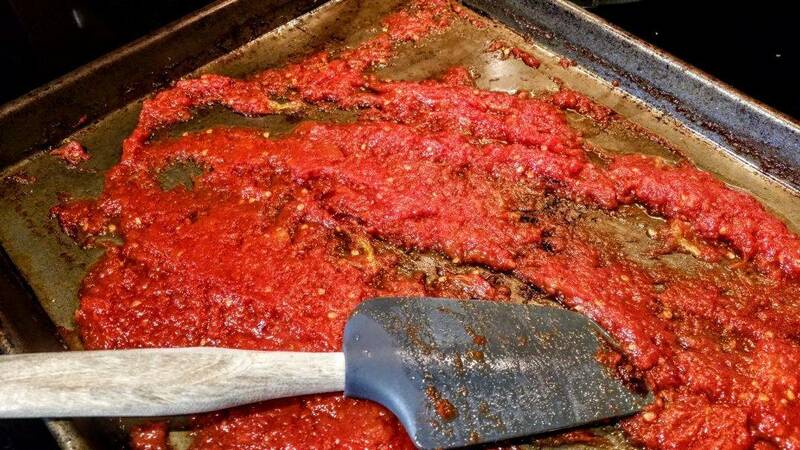 There is a much larger story surrounding my endeavor to make homemade tomato paste. This story will be told at a later date. Today, I will just share my triumph of will and patience that led to this culinary feat. I say feat, but really it’s pretty simple. I used our home-grown canned tomatoes from last season as I’m trying to get rid of them before the new crop ripens. Pre-heat your oven to 350 F. Oil your jelly roll or other similar type pan. Make your tomatoes mashed up. If you are using a blender, pour the tomatoes in the blender and give it a whirr. If you are using a food mill, run the tomatoes through that. If you are like me and super lazy when it comes to cleaning stuff, dump the tomatoes in the non-reactive pan and mash them with the potato masher. Put the mashed up tomatoes in your non-reactive pan over medium heat, stir frequently until much of the water has boiled off. Lower heat as necessary to ensure that the tomatoes don’t burn. When you feel like you can’t do anymore without burning the reduced mixture, transfer it to your oiled jelly roll pan and put in the oven. Check and stir every 15 minutes until your tomato mixture darkens and thick and pasty. If not using directly, cool and transfer your tomato paste to storage container. If you are going to store your paste for more than a couple of days in the fridge, you should consider topping the paste with a good layer of olive oil. You can also heat can the jars. So that’s about it. When I think about it, I’m pretty stoked I did this as I’m always disappointed in those little tinny-tasting cans of tomato paste you buy in the store. Blech. I hope you enjoy and keep an eye out for what happens next: Homemade Tomato Ketchup and Homemade Barbecue Sauce! As always, I appreciate your support and if you want any of the gear I use, check out my Amazon Affiliate List.